At Common Scents K9 your dog stays in our home and is part of everyday family life. They enjoy play time with other dogs, walks and hikes, quiet time, and hanging out with the family. Flexible drop off and pick-up appointments are offered. There will be no drop off or pick up appointments available on December 25th or January 1st. Holidays and long weekends book up very quickly, please reserve your dates well in advance. We can accommodate "special needs" dogs including puppies, seniors, medication requirements and specialized diets. Please note a medication administration fee will apply. All boarding dogs MUST be on a flea and tick prevention program. If fleas or ticks are found on your dog you will be notified and treatment will be done immediately. The additional charges will be applied to your invoice. Common Scents K9 does not require your dog to have the Bordetella (Kennel Cough) vaccine. However if you do have the Bordetella vaccine done, please wait 2 weeks after giving the vaccine before bringing your dog to Common Scents K9 for services. It is not necessary to send along your dogs bowls. Please do not send along any rawhide type treats as they are a chocking hazard for your dog and can also cause intestinal blockage. ​If you would like to have your dog groomed at the end of their Common Scents K9 holiday please book the grooming request at the same time as the boarding. Boarding rate for one dog is $35 per day. Two dogs from the same home $60 per day. Payment can be made by cash, cheque or email transfer. For Holiday bookings or bookings over 5 days a 25% non-refundable deposit is required to confirm your booking. If cancellation is required the deposit will be held on your account for 6 months to be used toward future boarding. Pick up and drop off services are available for an additional fee. 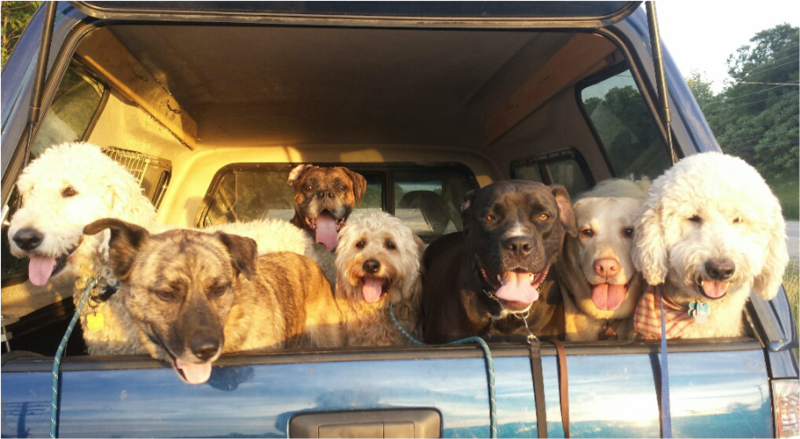 The gang patiently waiting to go for their summer evening hike!